Lidija Kareva , Kristina Mironska, Katarina Stavric. Clinic for children’s disease, Department of immunology, Faculty of Medicine - Skopje, Macedonia. Patients with X-linked agammaglobulinemia (XLA) are prone to recurrent bacterial infections due to low levels of immunoglobulins. Clinical symptoms include recurrent bacterial otitis media, bronchitis, pneumonia, meningitis, skin infection and arthritis.In the majority of cases arthritis can be shown to be caused by infection, but also aseptic arthritis and autoimmune diseases may be present. Monoarthritis and oligoarthritis is usual pattern, although polyarthritis may occur. This paper presents diagnostic and therapeutic problems in our patients with agammaglobulinemia and arthritis. Kareva L, Mironska K, Stavric K. JOINT DISEASE IN CHILDREN WITH X LINKED AGAMMAGLOBULINEMIA. J of IMAB. 2013 Jul-Dec;19(3):457-460. 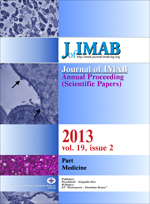 DOI: 10.5272/jimab.2013193.457. 4. Cassidy J, Petty R. Textbook of Pediatric Rheumatology. 1995, 466-486. 23. Wasowska-Krolikowska K, Krogulska A, Agammaglobulinemia and arthritis-diagnostic problems. Mon Sci Monit, 1997; 3(4):589-593. 26. Krausse R, Schubert S. In-vitro activities of tetracyclines, macrolides, fluoroquinolones and clindamycin against Mycoplasma hominis and Ureaplasma ssp. isolated in Germany over 20 years. Clin Microbiol Infect, 2010; 16(11):1649-55. [PubMed] [CrossRef].